The world drinks a lot of wine, and that means a lot of grapes are consumed every year. But not every part of the grape ends up in the bottle. Seeds, stalks and skins -- roughly a quarter of the grapes -- are typically discarded in landfills as waste. But now, researchers say they have found some useful commercial applications, such as prolonging the shelf life of fatty foods, for these wine leftovers. The researchers present their work at the 255th National Meeting & Exposition of the American Chemical Society (ACS). "Large amounts of grape waste may be detrimental to the environment," Changmou Xu, Ph.D., says. This waste, known as pomace, can cause surface and ground water pollution because pesticides and fertilizers used on the grapes can leach into the environment. In addition, the soil can become more acidic because of the pomace's low pH. Grape waste left in landfills can even contribute to the spread of diseases because it can attract flies and pests, he says. The global wine industry produces about 14 million tons of pomace every year, according to the Food and Agriculture Organization of the United Nations, and winemakers struggle with what to do with it. Xu's group at the University of Nebraska-Lincoln wants to rebrand grape waste as a renewable resource, using it to produce antioxidants, grape oils and dietary fibers for health products. Co-opting pomace for commercial use is a one-two punch to winemakers' waste problems. Not only could it increase the economic value of the grape and wine industry, it could also minimize environmental contamination, Xu explains. Pomace can be used as compost or fertilizer, and some winemakers have even produced a weaker, "second wine" by soaking waste grape skins in water and fermenting the mixture. But grape pomace is also a rich source of natural antioxidants such as proanthocyanidins, anthocyanins and ellagic acid. These antioxidants bind to free radicals -- toxic byproducts of oxygen metabolism that can harm the body -- so those radicals can't bind to and damage cells. These pomace ingredients, as well as grape seed oil, have been used in dietary supplements, pharmaceuticals and cosmetics. Using a holistic approach, Xu's team is identifying optimal technologies to extract, separate and identify nutrients from grape pomace, and then they will use those nutrients in commercial products. The technologies also must remove any pesticides that would have been used on the grapes. The group has collaborated with biologists to investigate whether polyphenols found in pomace are effective against foodborne pathogens like E. coli and Salmonella. They also have worked with physiologists to study how supplementing sows' diets with grape pomace from late gestation through lactation would affect the gut health, pre-weaning survival and growth in young piglets. "We are also developing some applications in food, aiming to substitute artificial antioxidants with natural antioxidants from grapes for a 'clean label' food with only natural ingredients," Xu says. The researchers separated the phenolic compounds from the other components of the pomace, including any pesticides that were used on the grapes, and added them to popular foods high in fat, like mayonnaise and ranch dressing. Before adding the phenolic compounds, the team also tested them to be sure they met safety requirements. They found that these compounds significantly inhibited lipid oxidation, extending the fatty foods' shelf life, especially when the samples were exposed to a warm temperature. Xu says that in a previous study, his team used polyphenols to reduce acrylamide formation in potato chips by 60 percent. "We are continuing to enhance efficiency of this inhibition and aim to make the phenolic compounds' performance comparable with that of ethylenediaminetetraacetic acid (EDTA), which is an artificial antioxidant," Xu says. Although EDTA is widely added to foods, cosmetics and medicine and is safe to use, it is not a very label-friendly ingredient in the current consumer climate. People are looking for food labels listing natural ingredients, Xu says. And grape pomace could provide one way to fulfill that need. American Chemical Society. 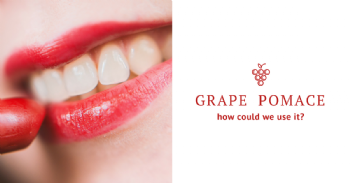 "From landfill to lipstick: Grape waste as a cosmetic and food ingredient." ScienceDaily. ScienceDaily, 19 March 2018. .